We're gathered here for the reading of Abe Hanson's will. His niece, Julia Hanson, will inherit the old lighthouse and all the property inside. The rest of the property will be divided amongst the remaining relatives. I didn't want it, but I need to understand why he decided to leave it to me. I'm sure I can find answers in the lighthouse. 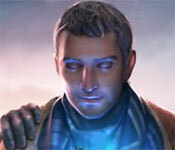 This game has a free trial version, click to start Edge of Reality: Hunter's Legacy Collector's Edition Free Download. If you like it, please buy the full version to support the developer, thanks.